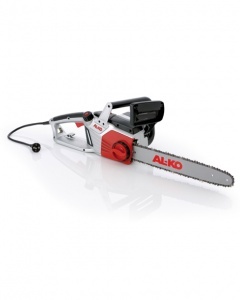 This 14 inch AL-KO electric chainsaw boasts high power, quiet operation and fatigue-free use. The powerful electric motor and 14 inch bar length, backed up by a fast chain speed and an original Oregon guide bar and chain, means you will experience top cutting performance you can really rely on. Thanks to the chain brake and hand protection bar featuring a quick chain stop, you will have the highest level of safety behind you in all working scenarios, allowing you to concentrate on the job without a worry. Automatic chain lubrication and a viewing window on the oil tank help to make looking after your machine even easier. 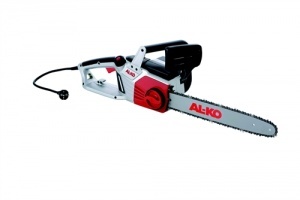 Due to the fast chain speed, high quality parts and 14 inch bar length, the EKS 2000/35 is a very capable machine. With its light weight of just 5.8 kg and extremely quiet running noise, you can use it without suffering any of the fatigue of heavy and loud petrol alternatives. 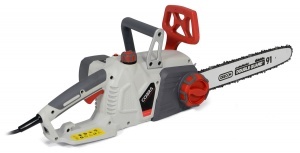 An electric chainsaw with improved cutting performance, this lightweight 1.7kW machine is great for craftsmen and cutting firewood. With a choice of 12 inch / 14 inch bar lengths.